Facility uses mix of architectural and structural precast elements to create an academic schoolhouse feel with a touch of sophistication. 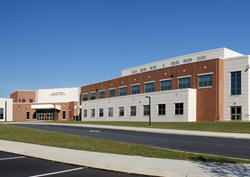 The Willow Creek Elementary School in Fleetwood, PA. High Concrete Group served as the precast producer for the project. This project was efficient and organized. And the timeframe - which included a late fall and winter construction schedule - would have been a challenge to accomplish with block and brick materials. For one growing school district in Berks County, PA, the time had come to build a new elementary school that could accommodate their increased enrollment. The Fleetwood Area School District moved ahead with plans to build a new school that would replace their current and outdated building. To achieve a green building solution with high performance benefits, the district opted for the use of precast concrete as a key element of the construction project. High Concrete Group, located in Lancaster, PA, was selected as precaster for the project, which took place in Fleetwood, PA. High Concrete is a producer member of the Mid-Atlantic Precast Association (MAPA). The two-story, 108,000-sq. ft. Willow Creek Elementary School was built with energy-efficient building materials that didn’t compromise durability or aesthetics. It features 44 classrooms, a cafeteria, gym, library, computer labs, art classrooms and music classrooms for approximately 700 students. Willow Creek was built in proximity to other school district facilities. The $22.1 million school was designed by AEM Architects, which also designed the nearby Tilden Elementary Center in Hamburg, PA. Both schools implemented the use of CarbonCast® High Performance Insulated Wall Panels. According to AEM project architect Justin H. Istenes, the insulated wall panels were chosen for the school because precast is built to last, and the district was satisfied they were getting better value with precast insulated wall panels. Thermally-efficient CarbonCast® High Performance Insulated Wall Panels used for the façade provide an R-value of 16. The panels incorporate three inches of extruded polystyrene (XPS) foam as continuous insulation (c.i.) sandwiched between the 3” exterior and 4” interior concrete wythes. C-GRID® carbon fiber grid was used as a shear connector between the two wythes. The high-strength carbon fiber grid helps the panels offer full composite action, while its negligible thermal conductivity prevents thermal transfer through the panel to cut energy costs. Use of steel in the building was limited to a few select locations. The building design also preserved usable floor space for students because load-bearing panels eliminated the need for perimeter columns on the construction of 44 regular and specialty classrooms, a gymnasium and library. In addition to the precast façade, floors are precast slab on grade and hollowcore plank on the second floor. The roof is TPO on steel deck over steel joists. Aesthetically, thin brick masonry is offset by buff-pigmented precast with cut reveals on the panel faces and a light sandblast finish. Similarly, off-white block paint on the interior provides a learning environment with a sophisticated tone. The exterior loadbearing precast walls are fully structurally composite. This means the interior and exterior wythes act together to resist gravity as well as lateral and seismic forces. The design enabled the walls to be thinner than other systems, preserving usable floor space for occupants. The precast facade was panelized to 14’ widths to minimize the number of joints and to optimize shipping efficiency. Interior walls are also structural precast which, according to Istenes, allowed the project to flow more smoothly during erection rather than having steel and block make up the structure on the building’s interior. Conduit for exterior lighting and fixtures was cast into the interior wythe of the panels for aesthetics and durability over time. “With precast, everyone was forced to think about what they’re doing,” said Istenes. “On block projects, contractors will often rush in before everyone has put their heads together; then they’re working on top of each other. But this project was efficient and organized. Once the panels were in place, we had little masonry work.” Istenes noted that the project timeframe – which included a late fall and winter construction schedule – would have been a challenge to accomplish with block and brick materials. The design of the school is simple in nature and provides an academic schoolhouse feel with a touch of sophistication. The main visual field is made up of masonry-clad insulated precast walls with strong buff-colored lintels and sills framing the windows. A buff square medallion is centered over each window. The façade is broken up by buff-pigmented insulated precast wall stair towers and accents in the library, in a large group instruction area and in office areas. Cut stone-like reveals on the panel faces bring a classic element that creates contrast while conveying substance. Istenes said the back surfaces of the insulated panels were trowel-finished with a smoothness that almost looks like gypsum board. The walls were painted with off-white block paint as are the exposed surfaces of the classrooms and halls. For a project photo gallery, visit the Willow Creek Elementary School Project Profile on the MAPA website.